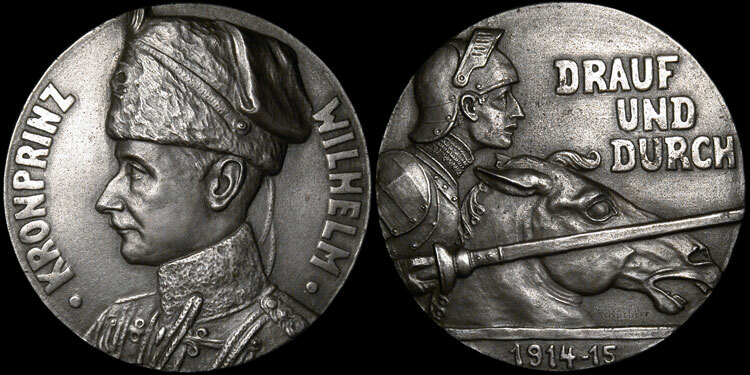 Obverse: Bust of Kronprinz Wilhelm, left, habited in the uniform of the Death's Head Hussar Regiment. Reverse: A fully armoured lancer on horseback charges right, in field "Drauf und Durch" (Forward and Through), "1914-15" in exergue. This is a very nice example of this medallion exhibiting graphite grey patina and silver highlights. An exceptionally crisp cast. This medallion has been conserved carefully over the years.